Whenever 'he' returns from market and gives me a bag of mutton, it always brings an extra big smile on my face and a great joy in my heart. I guess, this happens to many of you also ?. 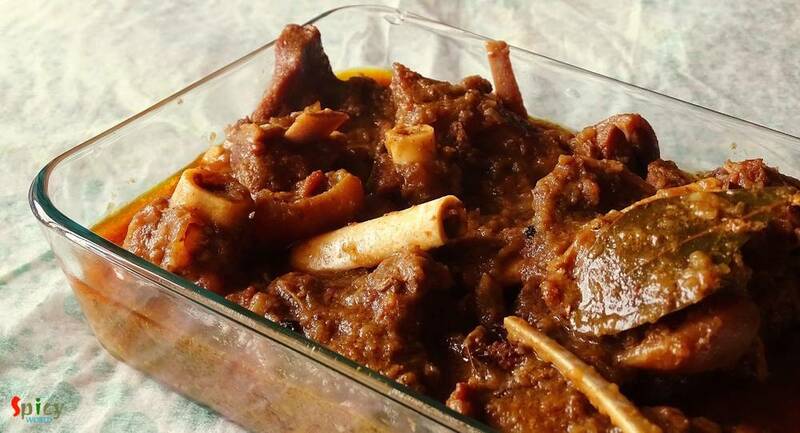 I always try to do something new to my mutton curry, because you all know about my experimental nature!! 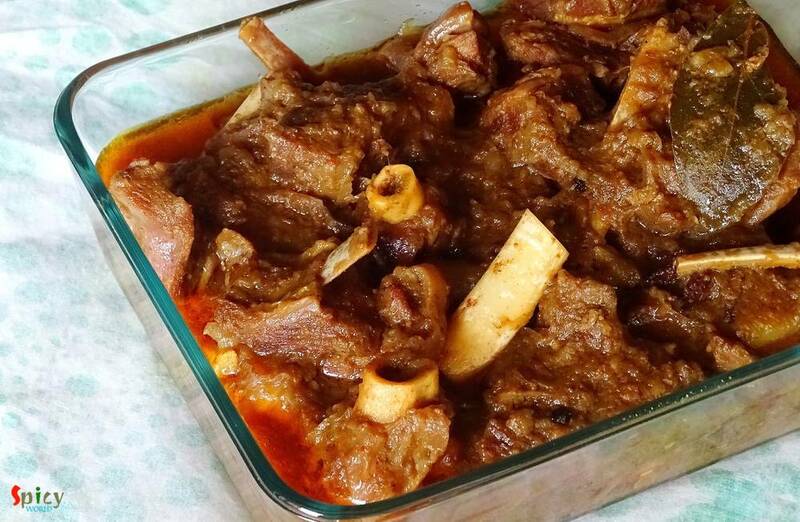 This time I made 'khara masala mutton', the taste was heavenly. After finishing the meal, there were nothing but bones in our plate. 'Khara masala' / 'kata moshla' means whole spices. You don't need to add any ground spices / paste in this curry. I think, this is an Eid special dish in Bangladesh. Always serve this mutton curry with plain rice, in that way you can purely enjoy the juicy mutton pieces with its aromatic gravy. Just give it a try and (I am sure) you will know what I am talking about. 15 - 20 pieces of mutton. 3 cloves of garlic roughly sliced. 2 inches of ginger, roughly sliced. 5 - 6 green chilies. Whole spices (2 dry red chilies, 4 green cardamoms, 2 bay leaves, 6 cloves, 1 small cinnamon stick and 1 Teaspoon crushed coriander seeds). 3 Teaspoons of beaten curd / yogurt. Put mutton pieces, onion+garlic+ginger slices in a kadai / pan. Add everything in the kadai except curd, water and oil. I just replaced dry red chilies with 1 Teaspoon of red chilli powder. Now add the mustard oil. You can replace mustard oil with white oil, but the taste will differ. Mix the entire thing with your hand very well and let it rest for 45 minutes. After that put the kadai on burner and turn on the heat. Add half cup of water, cover the kadai / pan and cook it in high flame for first 10 minutes. Then bring the flame to medium and cook the mutton for 1 hour. You don't need to add any water because mutton itself will release lots of water. After 1 hour the meat will look like this. Add the beaten curd and mix it for just 2 minutes. Now take a cooker and add 1 cup of water. 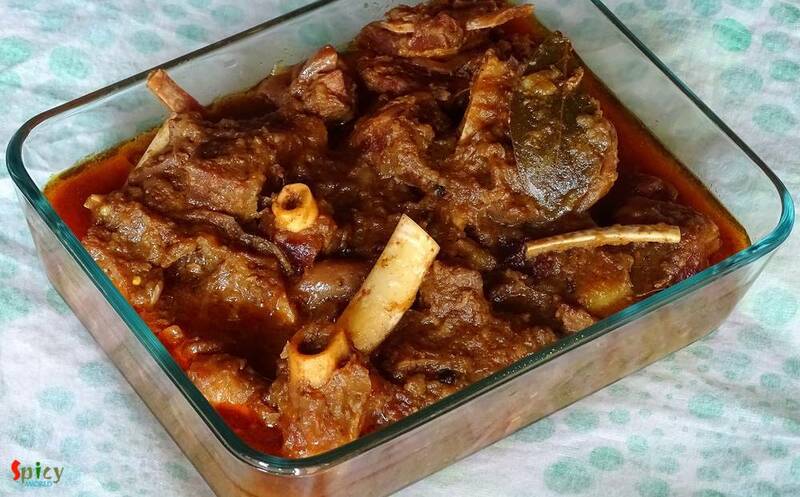 Add the entire mutton with gravy in the cooker. Give it pressure for 15-20 minutes or until the mutton becomes fully soft. I didn't have much time to cook, that's why I used cooker. But if you have time, cook the mutton in kadai until it become soft. The gravy will become more tasty.